I’ve been to lots of exhibition openings – but never a kiln opening before. This was a holiday treat too, something I found out about while away in Pembrokeshire, but it’s a good idea which could do with being copied. The ceramicist in question was Adam Buick, a name to watch whose work has already featured in national art, design and style publications. 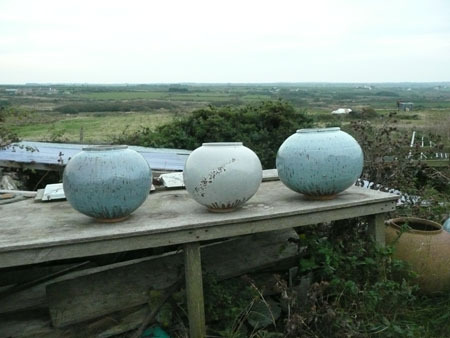 He focuses on making white porcelain moon jars, inspired by the Korean dal-hang-a-ri vessels, but of widely varying colour and size.